Randy Efros began his career as a Fine Arts Photographer over thirty-five years ago. A native of Arizona, Efros travels extensively in the United States and abroad seeking a wide variety of subject matter for his work. Both in color or black and white, a large body of work best termed "abstract" resulted in over forty-five one-man shows and 15 portfolios. His photographic talents early on brought him the attention and friendship of America's photographic family, the Weston's. 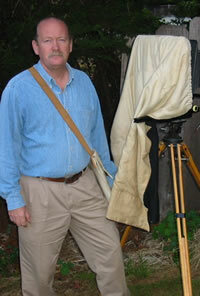 For over thirty years he has worked closely with Edward Weston's children and grandchildren. Sons Cole and Brett followed in their famed father's photographic footsteps and rose to prominence in their own right. Efros collaborated with Cole Weston in presenting photographic workshops and became Brett Weston's last assistant. Edward Weston's grandson, Kim Weston and Efros continue the Weston-Efros tradition by hosting workshops at Wildcat Hill, Edward's original Carmel home and studio as well as other locations in the United States and abroad.